Key System 1218 is a wooden line car of the tower flat configuration. The tower is a hand crank telescoping tower with a swing platform. The car has two-trucks and a single control station inside the tower. Car 1218 was built in 1929 by the Key System Transit Lines in their Emeryville, Ca. shops. It was rebuilt from a freight motor flat of the same number. The car was equipped with stake pockets external the side sill. The car was used to build the Shipyard Railway, as car 1201 was too wide. 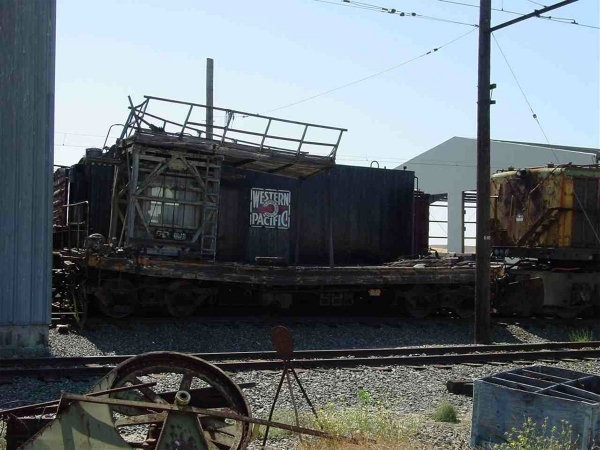 The stake pockets were removed at this time to give 1218 clearance to get by the high level platforms used on the Shipyard Railway in Emeryville and at the shipyards in Richmond. Technical Data: Wooden tower flat with swing tower. Built by Key System Transit Lines in their Emeryville, Ca. shops in 1929. Weight, 37,000 pounds. Trucks: Diamond arch bar. Wheels, 34-inch diameter cast iron. Axle, 4”. Journals. Traction motors, 4-40 horsepower @ 500 VDC, outside hung. 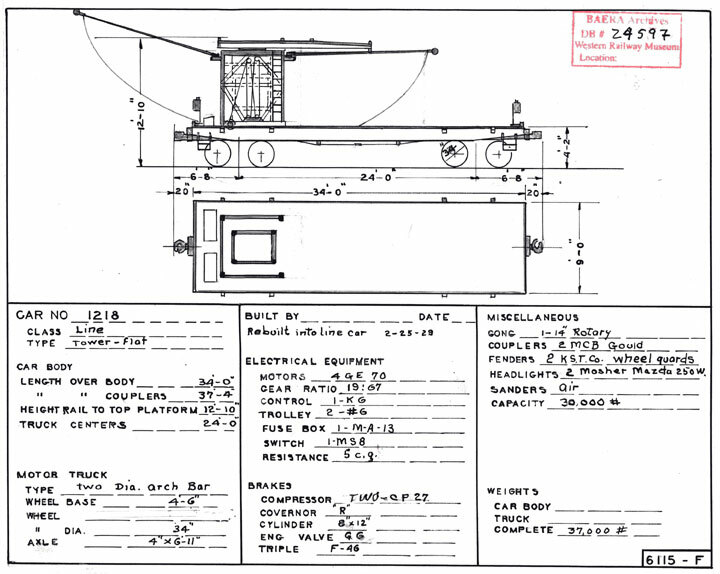 Air Brake Equipment: Westinghouse Traction Brake, SWA. Motorman’s valve, G-6. Independent valve. Triple valve, F-46. Brake cylinder, 8 X 12. Air compressor, two GE type CP-27. Dimensions: Width, 9’ 1/2” over side sills. Length, 37’ 4”. Height, 12’ 10”. Truck centers, 24’ 0”. Truck wheelbase, 54”. Propulsion Equipment: General Electric type K. Controller, K-6. Traction motors, GE 70. Gearing, bull 67 tooth, pinion 19 tooth, ratio 3.53 to 1, 5” face. Power resistors, GE type CG. Misc Data: Couplers, Gould 1904 MCG contour. Trolley wheel, 6” Kalamazoo. Trolley base, 2-US 6. Current Condition: This car is in poor condition. Proposed Future Treatment: This car needs a full restoration.